Virus populations can display high genetic diversity within individual hosts. 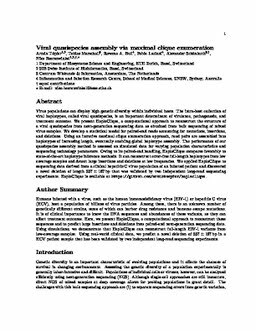 The intra-host collection of viral haplotypes, called viral quasispecies, is an important determinant of virulence, pathogenesis, and treatment outcome. We present HaploClique, a computational approach to reconstruct the structure of a viral quasispecies from next-generation sequencing data as obtained from bulk sequencing of mixed virus samples. We develop a statistical model for paired-end reads accounting for mutations, insertions, and deletions. Using an iterative maximal clique enumeration approach, read pairs are assembled into haplotypes of increasing length, eventually enabling global haplotype assembly. The performance of our quasispecies assembly method is assessed on simulated data for varying population characteristics and sequencing technology parameters. Owing to its paired-end handling, HaploClique compares favorably to state-of-the-art haplotype inference methods. It can reconstruct error-free full-length haplotypes from low coverage samples and detect large insertions and deletions at low frequencies. We applied HaploClique to sequencing data derived from a clinical hepatitis C virus population of an infected patient and discovered a novel deletion of length 357±167 bp that was validated by two independent long-read sequencing experiments. HaploClique is available at https://github.com/armintoepfer/haploclique. A summary of this paper appears in the proceedings of the RECOMB 2014 conference, April 2-5. Toepfer, A, Marschall, T, Bull, R.A, Luciani, F, Schönhuth, A, & Beerenwinkel, N. (2014). Viral Quasispecies Assembly via Maximal Clique Enumeration. PLoS Computational Biology, 10(3).